1 1/8 x 5/8-inch Sterling Silver St. Michael / Nat'l Guard Medal. 1-1/4" Sterling Silver St. Christopher Medal Made in the USA. The Oval shaped Medal is adorned with St. Christopher carrying the Infant Jesus. This Sterling Silver Oval St. Christopher Medal is made in the USA. I ordered this necklace as a gift. I was hesitant since I had never used this site before but boy was I impressed! I even engraved the back of the medal, order was placed by 12pm and by 3pm the SAME day the order was shipped. I was nervous that the quality would be cheap. I received the package today, and it looks even nicer in person! GREAT QUALITY, BEAUTIFUL PACKAGING (came in gift box), I just LOVED IT!!! Totally worth the money. I will definitely be using this site in the future. 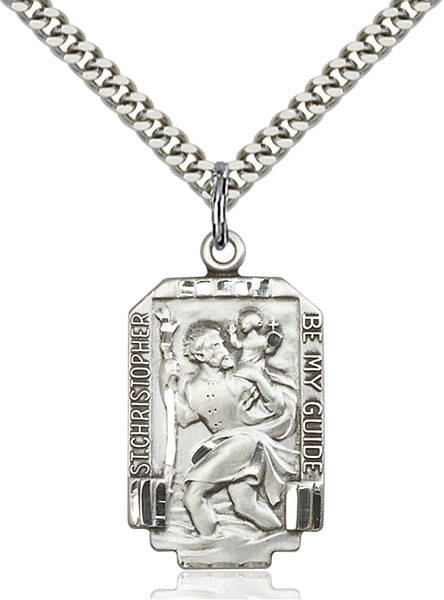 This Sterling Silver St. Christopher Pendant - Engrave it! has passed our quality control assessment and meets our strict criteria to be a Catholic Shop product. Buy with confidence. Catholic Shop aims to carry the finest products on the market. 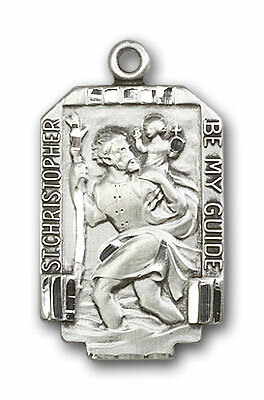 Our staff has inspected and tested this Sterling Silver St. Christopher Pendant - Engrave it! and found it to be worthy of our Satisfaction Guarantee.